Having a garden has always been an exciting thought to me but the act of gardening has always appeared a puzzling chore to me. I mean, why is it so complex? If you bury a seed in the ground, why shouldn’t it sprout and then progress onward to a fruit or vegetable? How can something older than time, a natural miracle before the concept of farmers and gardeners, be so delicate and tedious? Of course I wasn’t thinking of construction and environmental changes amongst other deeper issues that don’t enter my mind in those self consumed moments of frustration. 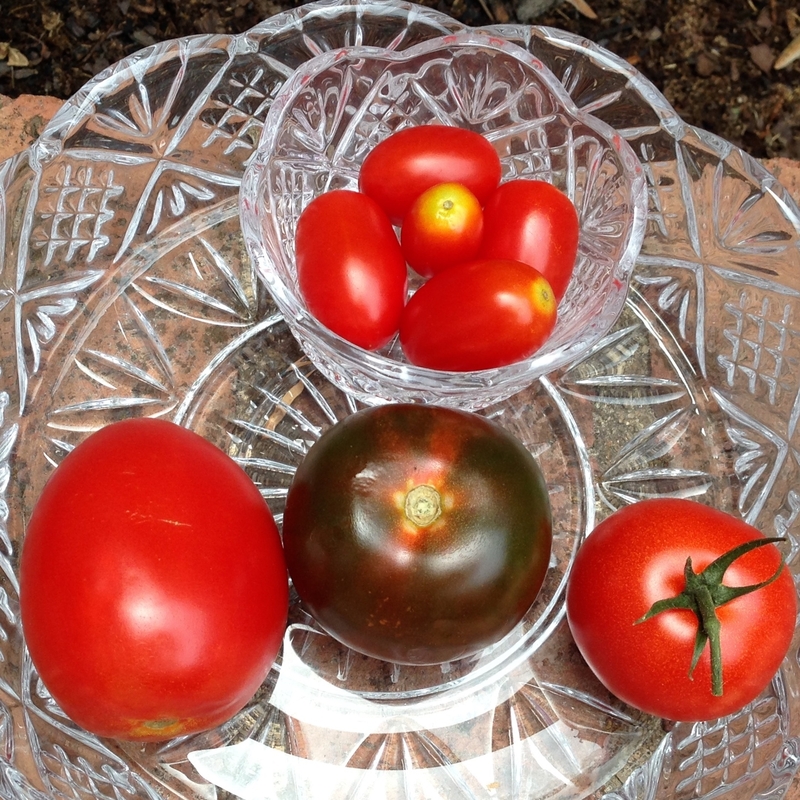 My family of four fought over the ONE cherry tomato my plant produced every 3 weeks last year. We literally divided one in fourths. I mean seriously. 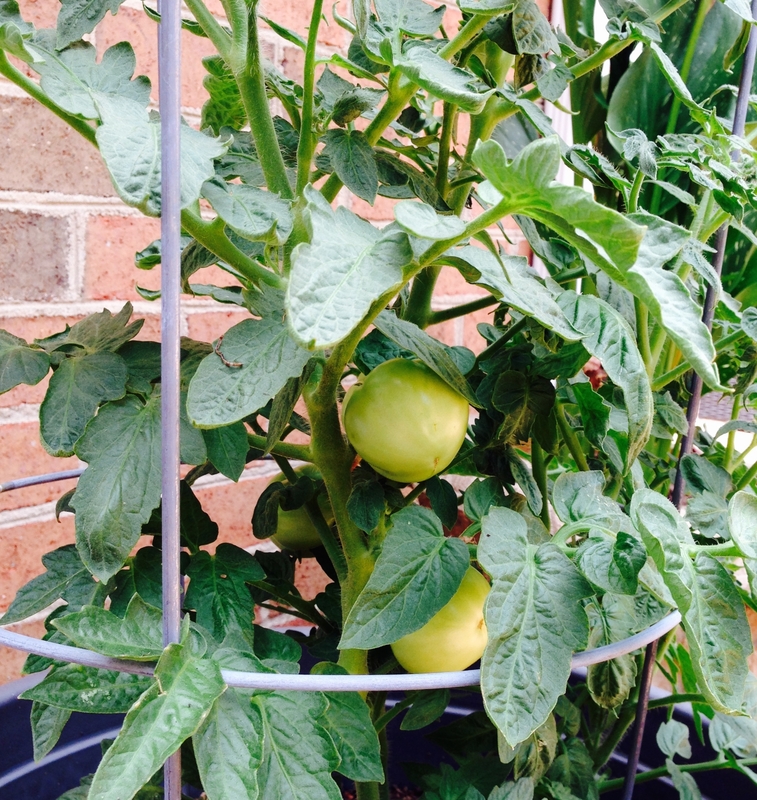 But I must say my current container tomato plant has 6 green medium fruits on it right now. Cross your fingers. It could be my lucky year. Thankfully, I have befriended herbs. After many basil plants withering away, I finally found a sweet spot for one in my yard. I literally mark its hole at the end of the season and plant another exactly right in its place every April. Thyme, oregano,and parsley return faithfully. Cilantro even stayed a while this year! Anyway, on to talking about food. 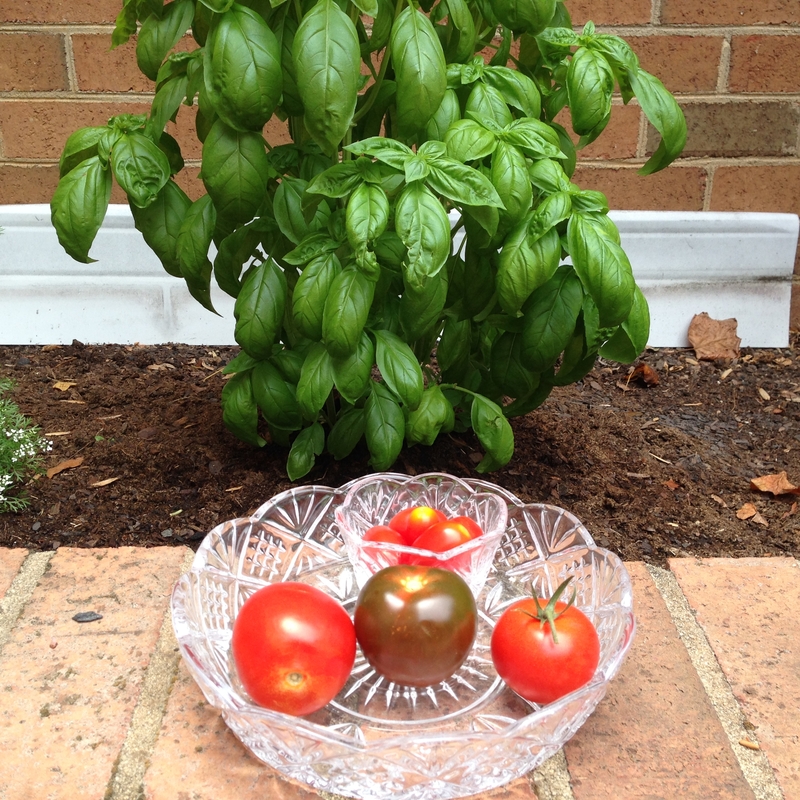 Basil is categorized as an herb but has all the nutritional properties of a dark leafy green. No need to miss the lettuce, spinach, or kale here. When it comes to tomatoes, I’m no connoisseur and not picky about the type. Below are some from the store: grape, plum/Roma, vine ripened, and Campari. Any tomato, as long as properly ripened will do. Tomatoes are a food I do feel strongly about spending my dollar to buy organic. The reason is that they are highly pesticided, have a thin skin, we eat the skin, and quite honestly, DO taste better organic. The flavor and texture is a lot better when they are stored at room temperature rather than in the fridge. 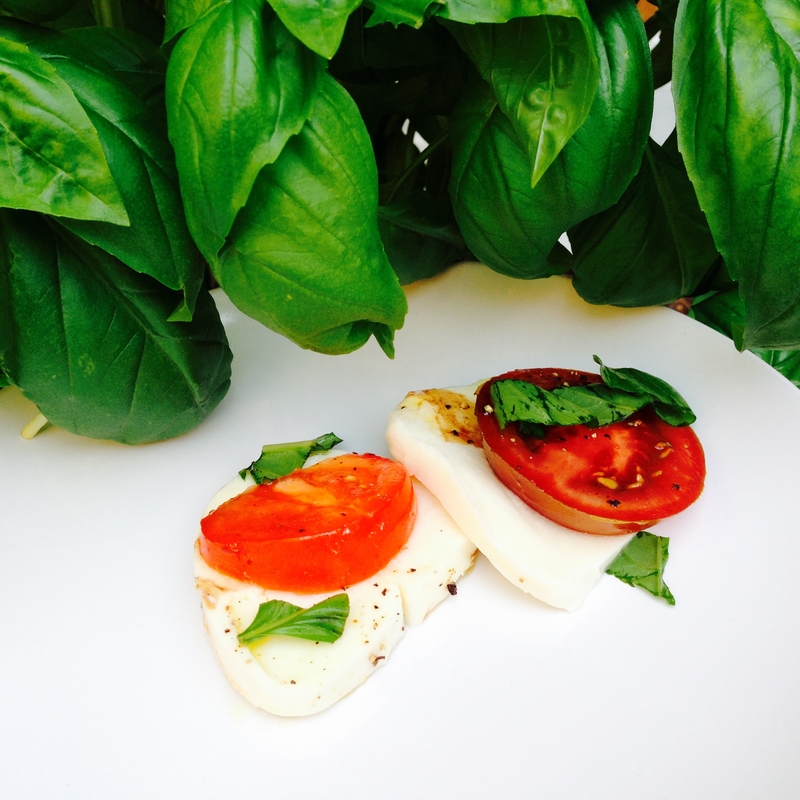 Unless they have already been sliced and are marinating with some fresh mozzarella in a balsalmic…Enter Caprese salad which originated in Italy and reflects the colors of the country’s flag. This is a favorite salad and appetizer all in one and makes a nice presentation for company or a potluck. No awkward leaves to fit into your mouth or heavier salad ingredients sinking to the bottom of your serving bowl. It is one item on a fancy Italian restaurant menu that isn’t daunting to make. Takes minutes to prepare and delivers gourmet sophistication with simple, bursting flavors. You can layer the ingredients in a pattern on a tray, buy mini mozarella and tomatoes to put on toothpicks or skewers, or just toss it all together in a serving bowl. This is also a fool proof dish that you can apply “a little of this and a little of that” and come out just fine in the end. Feel free to modify the recipe below. 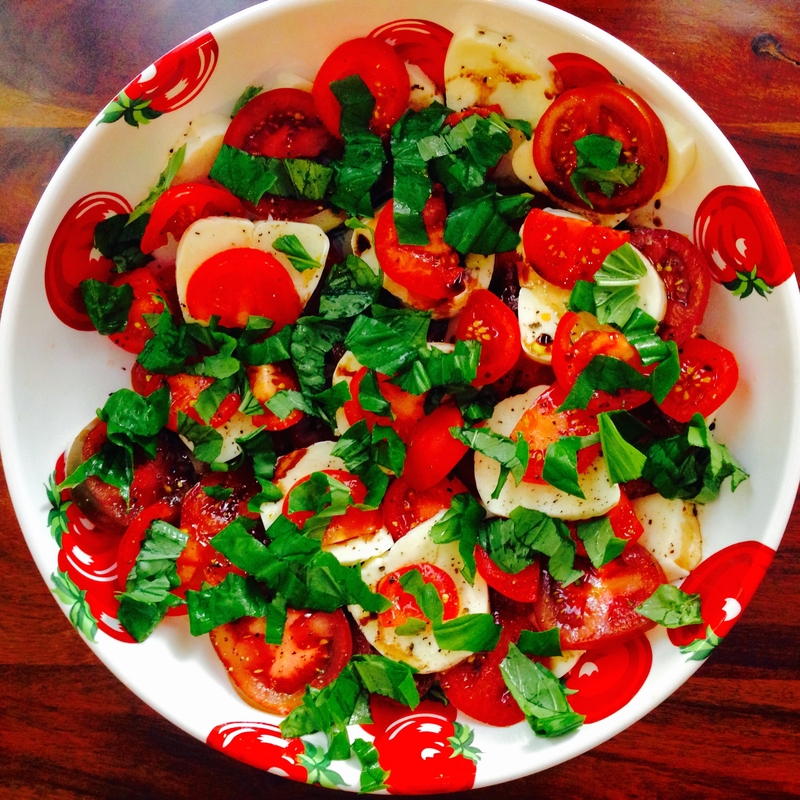 Arrange mozzarella and tomato slices in desired serving dish. I like trying to place a tomato on or near a piece of cheese. Scatter basil all over it. Drizzle liquid ingredients and sprinkle on salt and pepper. Toss if you wish but it will seep down. Alternatively, you can whisk together the oil, vinegar, salt, and pepper and then pour over the salad. You can even serve this salad with my Zucchini Spaghetti. 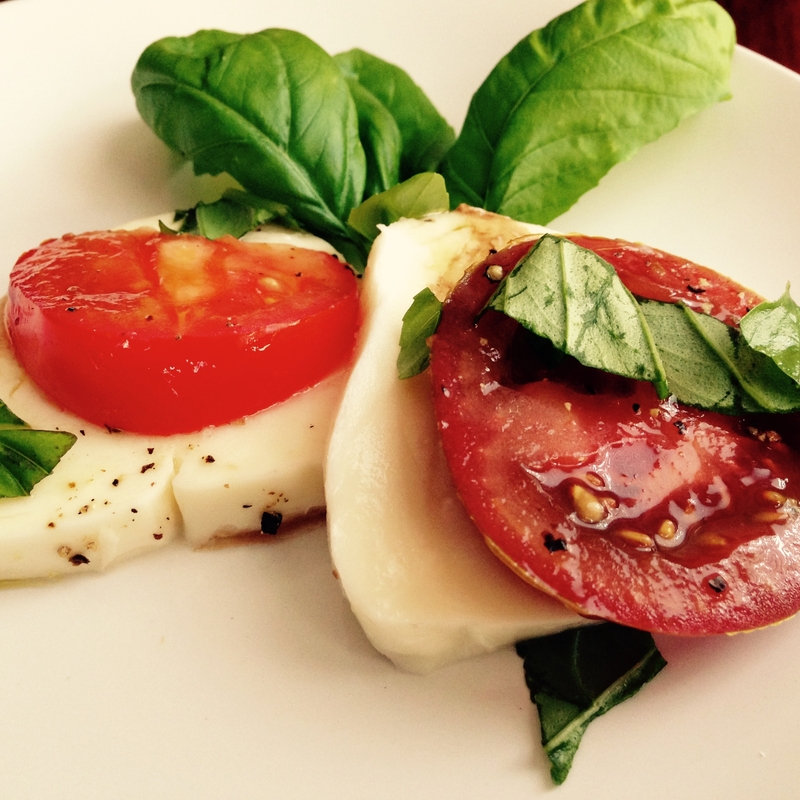 Also check out my Caprese ‘Wich and I’ll report back about my garden!